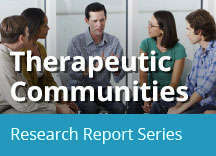 Home » Publications » Research Reports » Therapeutic Communities » How Is Treatment Provided in a Therapeutic Community? Therapeutic community (TC) participants advance through three treatment stages on the way to completing the program (Bunt et al., 2008; Perfas & Spross, 2007; Dye et al., 2012). In the first stage, the individual assimilates into the TC and is expected to fully participate in all activities. Immersion into this drug-free community is meant to disrupt the individual’s identification with and ties to his or her previous drug-using life and replace these affiliations with new pro-social attitudes, behaviors, and responsibilities, and increase his or her knowledge about the nature of addiction. CBT is a form of psychotherapy that teaches people strategies to identify and correct problematic behaviors in order to enhance self-control, stop drug use, and address a range of other problems that often co-occur with them. Motivational interviewing is an evidence-based treatment and counseling style that helps patients explore and resolve ambivalence about changing their behavior in a focused and goal-directed way. In the third treatment stage, the participant prepares for separation from the TC and successful re-entry into the larger community by seeking employment or making educational or training arrangements with the TC’s help. Because recovery is an ongoing process, aftercare services such as individual and family counseling are arranged to help individuals maintain the changes they have made during treatment, and TC participants are strongly encouraged to continue work in self-help groups after completing the program. Historically, participants stayed in a TC for as long as they needed to progress through these treatment stages—typically, 18 to 24 months. In recent years, funding and insurance limitations have reduced the length of stay in many areas of the country to treatment durations of 3, 6, or 12 months (De Leon & Wexler, 2009). However, research clearly demonstrates that longer time in treatment is associated with better outcomes (De Leon, 2012) (see "How Are Therapeutic Communities Adapting to the Current Environment?"). For example, individuals who have participated in a TC for a minimum of 90 days fare better than those in therapy for shorter periods (Simpson, 1981). TC programs have responded to the changing health care landscape by enhancing their continuum of services, ranging from engagement to residential treatment to continuing care post-treatment. TCs often adjust their services as needed by matching various treatment options to problem severity, adjusting therapeutic goals to the planned duration, and combining residential and outpatient components to give participants the necessary time in treatment (De Leon, 2012).